Almonds come from a tree that is native to the middle-east and south Asia. Fruit of tree is not technically nut, rather a drupe. A drupe is a fruit that has an outer fleshy part surrounding an inner hard pit, such as Peach or nectarine. Processing with hot water removes the hard parts and the fruit is then sold as blanched almonds. Almond trees are small, deciduous, 4 – 10meteres in height and reach fruit bearing maturity within three years of planting and full yield within six. 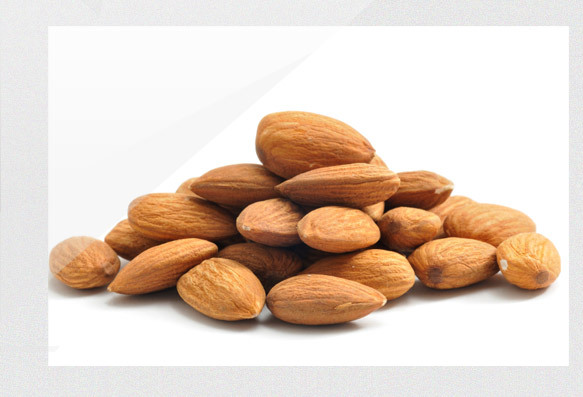 Almonds are a domesticated form of a plant found in the Middle East and whose fruit, when bruised and damaged generates hydrogen cyanide which is why the poison is often reported as having an almond scent. Worldwide production generates a crop of some 1.85 million tonnes in 2002 according to the Food and Agriculture organisation. The majority of production is in the Mediterranean zone with Spain, Syria, Italy and Morocco producing some 415,000 tonnes. The United States of America is the single largest producer, growing 715,000 tonnes in that year, and most of this crop is concentrated in the Californian region. In America, pollination of the crop is achieved by the movement of bee hives, rather than by indigenous pollinators. Current concerns about the viability of bee hives following unexplained deaths in recent years does place some concern over the Californian almond industry’s future.